Personalized 2 Side Oversized Professional Hanging Sign - - for accountants, lawyers, doctors, dentists, and other business offices. Two-side hanging natural slate address plaque. Text is the same on both sides. 14" x 18" or 16" x 20" oversized hanging sign is custom made for you. Holds five lines of custom text that you can use to identify your firm's name, your name, profession, specialty, address, etc. Five design choices: medical logo, accounting logo, dental logo, legal logo, decorative arch shape border without a logo. Two color choices: white letters on black slate or gold letters on black slate. Line 1 with logo holds up to 12 characters; height is proportional to the size of the sign. Line 1 with arch shape border (option 9 or A) holds up to 5 characters; height is proportional to the size of the sign. Line 2 holds up to 15 characters; height is proportional to the size of the sign. Line 3 holds up to 5 characters; height is proportional to the size of the sign. Line 4 holds up to 15 characters; height is proportional to the size of the sign. Line 5 with logo holds up to 15 characters; height is proportional to the size of the sign. Line 5 with arch shape border (option 9 or A) holds up to 12 characters; height is proportional to the size of the sign. Hang on a post close to the road for excellent roadside visibility . . . especially good on rural roads, busy shopping streets, and office parks. 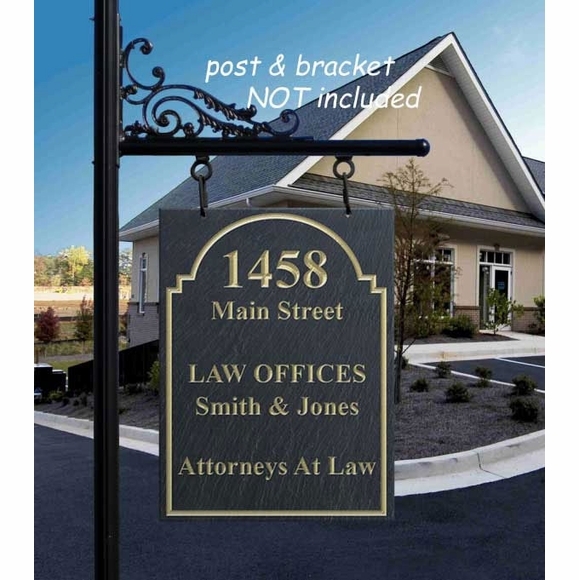 The oversized hanging address sign also comes in a standard one-side version (see Related Products).